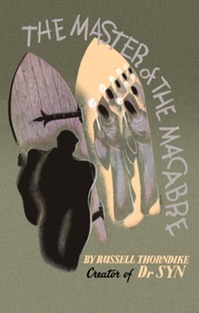 Most people know about Russell Thorndike’s Dr. Syn series, but few are aware of his The Master of the Macabre novel. He wrote 7 novels about the smuggler/pirate/chaplain Dr. Syn (thrice filmed), but had time to pen a some historical novels too. Thorndike appeared on stage and in film. Once again, Valancourt is to be commended for bringing this book back into print and e-book form. The Master of the Macabre is a book of stories within stories. One winter, Taylor Kent leaves London for healthier environments. In route, he stops at a medieval abbey which has been transformed into a mansion for Charles Hogarth. With him is an envelope which he is to deliver. All he knows is that it has “For The Master of the Macabre” written on it. Kent soon finds out that Hogarth has a collection of curiosities. It contains a medieval key, ship’s wheel, skull, shovel and many other pieces. Hogarth has collected each one because the given object has a sinister story behind it. A very macabre story. And there is a ghost in the house which Kent continues to see in his dreams. The ghost is the linking element to all of the other stories,but this doesn’t become apparent until the end of the novel. What makes this collection such a joy to read is how he presents each tale. For the most part, the stories do not have an individual chapter. Kent, who is convalescing at the abbey after running his car off the road, asks his host about each object and receives the tale which comes with it. “She wore a sort of jerkin made from an old sail, but it was lined with white fox, and she carried a tough staff whittled sharp at one end. I don’t know what she did with that. Spiked fish, perhaps—or rivals. This is a fun book, best read on a cold winter’s night.